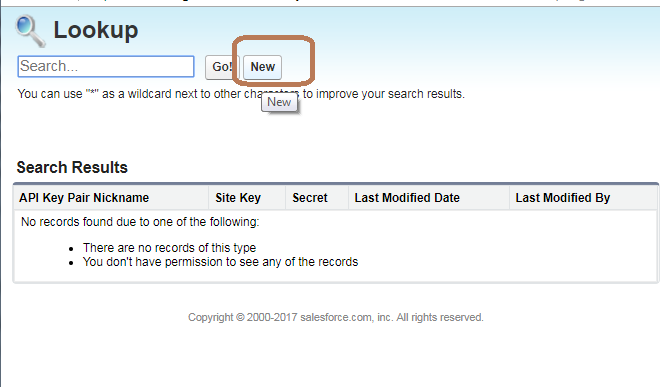 Salesforce has already provided a cool out of the box feature where you can generate HTML for the web to lead form, which you can simply put on your website. It is very simple to generate the customized form with fields of your choice to generate leads for your company through various company portals or social platforms. But till some time back, there was no spam check and anyone with wrong intentions could create junk lead data repeatedly in your company’s org, just by writing some small script. Because of this, it becomes a concern for the organization to keep a track of the Lead data quality on a large scale which results in more resources wasted in correcting data quality. Spring ’17 release enhancement introduced a feature, which allows you to enable spam filtering with reCAPTCHA from Google. This option is available in out of the box feature itself on the same screen as previous. But before generating the form (web-to-lead HTML) now, you need to register for an API Key pair with Google for your domain. Login to your company’s google account or for your practice you can log in to your own personal Google account. 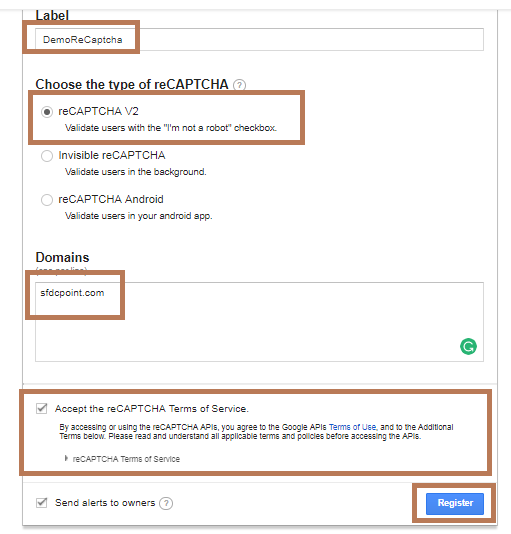 Once logged in, Register here for the reCaptcha with google. Don’t forget to give your domain name, otherwise, your captcha box won’t work and will give you an error. The domain name has to be of that site, which will host your web-to-lead form. In my case, I have shown SFDCPOINT.COM, just for example. My demo domain is different, so I registered that as well later. Click on Register after checking the checkbox “Accept the reCAPTCHA Terms of Service“. You will get the Site Key and Secret Key on the next page, just copy and save it somewhere. NOTE: After clicking on register, and before testing your web to lead form on your website, there should be a gap of at least 30 minutes, as Google can take some time to activate the key for your domain. Now you are done with the registration of API Key Pair with Google. 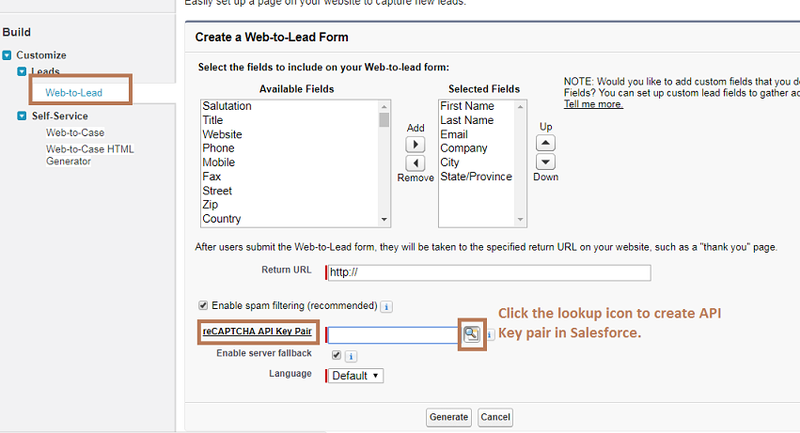 Now Let’s use the same site key and secret key in Salesforce in order to get Salesforce Web to lead form with reCAPTCHA feature. Go to Setup –> Leads –> Web-to-lead. 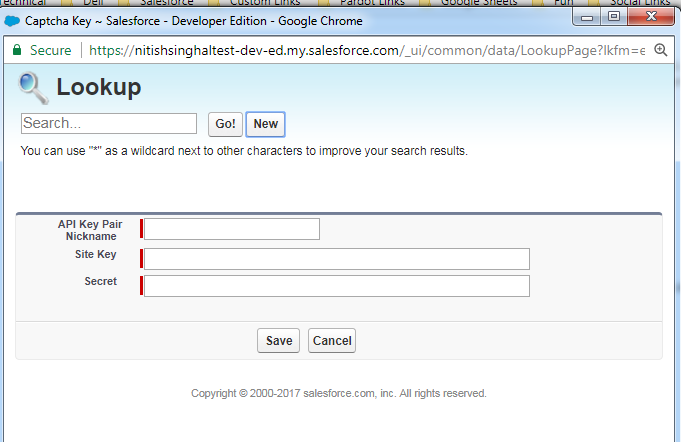 Click on “Create Web-to-Lead Form” button. Select the fields you want on the form, give the redirect URL, and come down to enter the API Key Pair information. Select “Enable Spam Filtering” checkbox to see the API key information section. Clik on the Lookup icon to enter the info about the site key and secret. In the popup window, Click New Button. Enter the name of your choice, and Site Key and Secret Key, Click Save. If you encounter “Insufficient Privileges” error while saving the key information, then follow the instructions in Step 8 else go to Step 9. Go to Setup -> user interface. 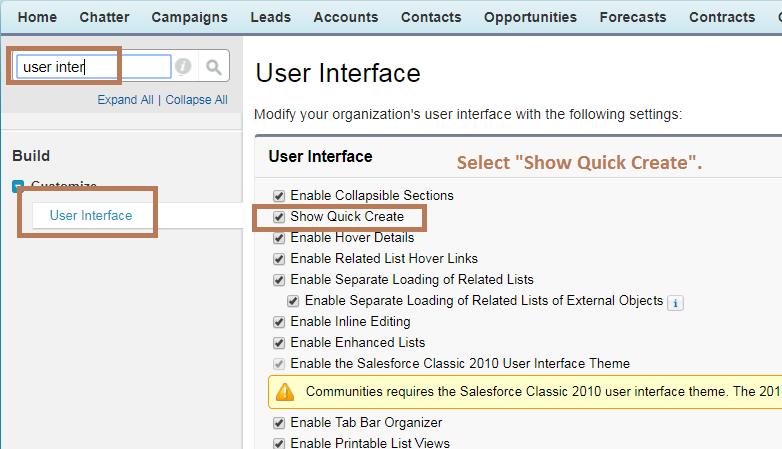 Make sure to select the checkbox “Show Quick Create”. Click on Save button at the bottom. Repeat the Steps 5 – 7 again. Click on Generate button, and you have the HTML code ready to put on your company’s website and start capturing leads from there. In the above code, I have made small modifications, just to make sure that form doesn’t submit until somebody has verified captcha by clicking “I am not a robot”. Try generating the form, and comment if you face any issue in using the web-to-lead form on your website. NOTE: For security purpose, I have changed the org Id and Secret Key in both the code samples above.